This past Saturday, I was featured as the expert source in an interior design article in the Spaces section of the Salt Lake Tribune and Deseret News. The piece focused on how to combine design styles in small spaces. 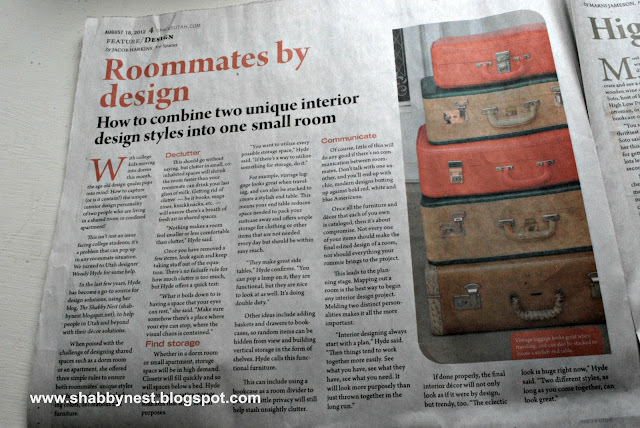 Although the article was aimed at those who might be sharing dorm rooms - it is back-to-school time after all - the ideas I shared are great tips for anyone living in a small space. 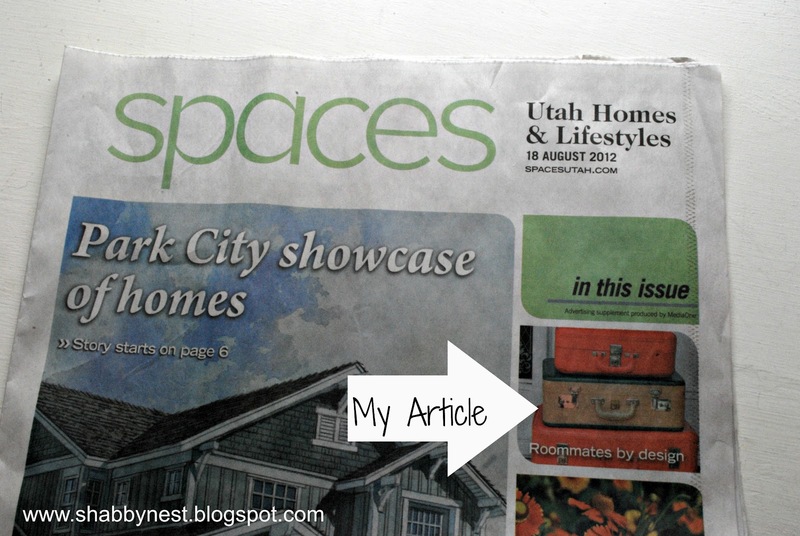 The front page of the Spaces section, the article I am featured in is titled "Roommates by Design"
As I noted in the article, "nothing makes a room feel smaller or less comfortable than clutter." So designing for a small or shared space is really all about clutter control. 1. Find creative storage: if you can make something work for storage - do it. As I mentioned in the article, things like vintage luggage or baskets with lids make great side tables, "you can pop a lamp on it, they are functional, but they are nice to look at as well. It's doing double duty." 2. Make furniture do double duty. I suggest using bookcases as room dividers (Ikea Expedit bookcases do this especially well because they are open front and back.) Pop baskets in them to hide unsightly items. 3. Go vertical. Using vertical space is a must in a small, shared space. Shelves are a perfect way to store rarely used and display items. And finally, make sure you communicate with those you share the space with. Compromise is important when you are combining design styles. Again, as I state in the article good "interior design always starts with a plan." If you start with a plan, you can see what you have and what you need, then work to create a space that will look great. 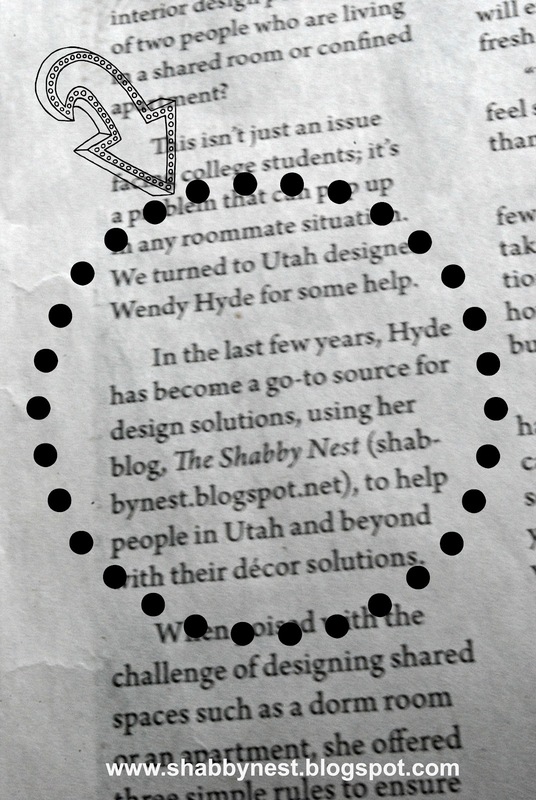 I am flattered that they called my blog a "go-to source for design solutions." So nice!! A great big thanks to the author of the article, Jacob Harkins, for including me in the piece! Congratulations Wendy! That's awesome! I love your tips too. congratulations Wendy. well deserved praise!